Ivacy is one of the fastest VPNs around and also one of the best VPNs for torrenting. If you are a fan of this VPN service and you are thinking about getting or renewing an Ivacy subscription, there is no better time than the present. With Ivacy’s amazing Black Friday deal, you can get years of high-level protection for only a fraction of the standard price. 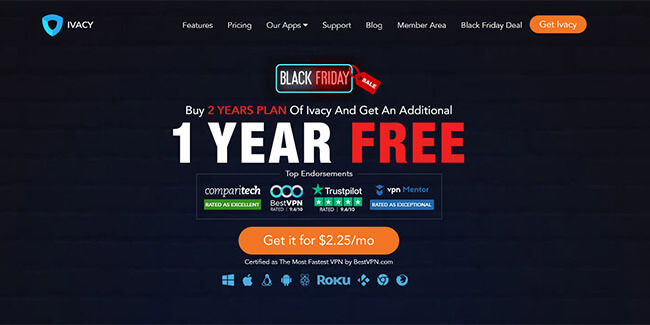 We happily introduce you to Ivacy VPN’s super-special Black Friday offer. Offer: Enjoy an 87% discount on your 5-year Ivacy subscription! Only on November 23, you can get 87% off your 5-year Ivacy subscription and pay just $1.34 per month! As you can see, there is no time to hesitate, since the offer expires at 11:59 on Black Friday. Thus, we warmly advise you to take advantage of this incredible discount now and enjoy half a decade of worry-free browsing, streaming, downloading, and torrenting. Offer: Get the 2-year Ivacy plan and enjoy 1 extra year of protection for free! Now you can save 77% on your Ivacy subscription with the special Black Friday deal that allows you to get an additional year for free with the 2-year Ivacy plan! That means that you only pay $2.25 per month!